Our rigorous tests and the experience of numerous users have shown that ZQuiet and SnoreRx are among the finest anti-snoring solutions currently available on the market. That is why, when the time comes to choose one of them, the decision seems almost impossible to make. Luckily, this detailed and objective ZQuiet vs. SnoreRx comparison can help you quickly find out which device is ever so slightly better than its alternative. ZQuiet is one of the best mandibular advancement devices on the market. Known for being flexible and comfortable, it addresses your snoring at its roots by gently pulling your jaw forward and minimizing compression in your airway. ZQuiet is flexible enough that you can even drink while wearing it. ZQuiet mandibular advancement device does not have a set expiration date, but you should replace the product once in every six months. ZQuiet is made of a medical-grade material that is both BPA and latex-free. Following all FDA guidelines, the material is odorless, tasteless, and non-toxic. It is also very soft, which makes the mouthpiece comfortable and easy to get used to. ZQuiet doesn't offer any customization options or use the boil-and-bite method to achieve a perfect fit. You can just take it out of the box and start using it right away. If needed, you can use small scissors to trim your ZQuiet and a nail file to smooth out any rough edges. As an oral appliance, ZQuiet may cause some discomfort in first-time users. You should get comfortable with the device in just a couple of days. 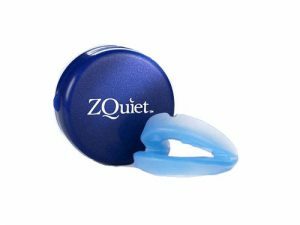 ZQuiet mouthpiece is a device designed to prevent your lower jaw from moving backward as your muscles relax. This keeps your tongue in its natural position and prevents it from blocking your airways, obstructing your breathing, and causing vibrations known as snoring. You should clean ZQuiet with warm water and mild dish soap. Use a toothbrush for optimal results. The use of a toothpaste may discolor the device and alter its surface. Make sure to rinse the mouthpiece under water to remove any traces of soap prior to storage. $9.95 trial fee + $79.95 after 35 days. ZQuiet mouthpiece comes with a 30-day money-back guarantee. If the device doesn't work for you, you can get a full refund, excluding the trial, shipping, and processing fees. ZQuiet does not come with a warranty. Worked like a charm for my husband which means we both get to have some quality sleep at last. His jaw did get quite sore for the first two weeks though and he had trouble chewing for like an hour or two after taking the mouthpiece out. I bought this one by mistake and later realized I can’t use it with my tooth implant so be aware if you have them as well, this is not the mouthpiece for you. On top of reducing my snoring, this device also helped me improve the posture of my lower jaw. My wife and I both got one and it worked perfectly for both of us. We wake up well rested and fresh, and we never wake each other up during the night. Are you struggling with snoring and looking for a mouthpiece to solve your snoring issues forever? Take a look at our ZQuiet review in order to determine if this mandibular advancement device is right for you. With ZQuiet, there is no fitting process, as one size fits all. There is no molding of any kind and you can use it straight from the box. Due to the absence of a fitting process, it may happen that the device does not fit quite right, but it is rather unlikely. SnoreRx does require molding, which is executed with the use of boil-and-bite technology. The process, which is not complicated, ensures the best possible fit. Both ZQuiet and SnoreRx are FDA-approved, which means that they are safe to use and the materials used to make the devices are of high quality. Therefore, both devices have received the highest scores in terms of material quality. ZQuiet is not adjustable, as it is made to fit any jaw. On the other hand, it does come in two sizes, one for mild snoring and one for more serious snoring problems. SnoreRx is known for its amazing adjustability. By employing unique, advanced technologies, it offers you the possibility to make micro-adjustments and allows you to lock the device in the position that suits you best. ZQuiet is not famous for its longevity. In most cases, a single device lasts for several months. Still, with proper maintenance and without teeth grinding, it may even last for nearly a year. SnoreRx device should last for 11 to 15 months. Once again, we have to stress that the lifespan of mandibular advancement devices is affected by a number of factors, including but not limited to sleep bruxism and maintenance. SnoreRx is a bit pricier than ZQuiet. It is also important to note that with ZQuiet, you get two devices, one in each size, which makes it even more affordable. It is quite hard to say which of these two devices provides a better overall experience, as they are both excellent anti-snoring solutions, no matter how you look at them.